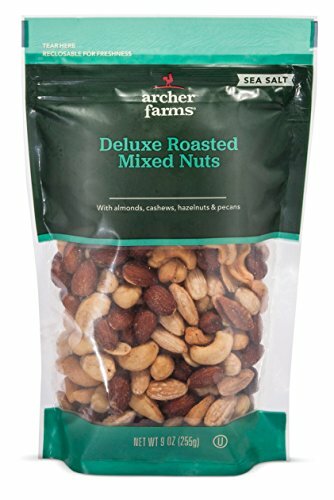 Be the life of any party when you show up with the Deluxe Mixed Nuts with Sea Salt 9.5 oz - Archer Farms. These tasty nuts are great for putting out for company or simply enjoying as an everyday protein-packed snack. Includes sea salt-dusted cashews, almonds, hazelnuts and pecans. Whoever said you can't guarantee happiness clearly has never tried Archer Farms. You'll love every little bit, bite and sip. Deluxe roasted mixed nut blend. Contains almonds, cashews, hazelnuts and pecans. If you have any questions about this product by Archer Farms, contact us by completing and submitting the form below. If you are looking for a specif part number, please include it with your message.